T-27 wheels that are 1/8" thick can be used with right angler grinders for cutting and pipe weld grinding. 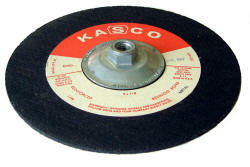 For heavier grinding use the 1/4" thick wheels. All T-27 wheels need to be mounted with proper back support. Wheels with the 5/8-11 ready mount can be installed directly on to the grinder shaft. Wheels with 7/8" arbor holes will require an appropriate supporting flange like our CP-50 adapter. 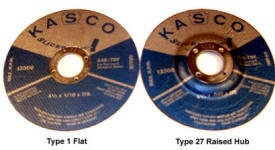 Our thin Slice-It Wheels come in both flat T-1 and depressed center T-27 shapes.